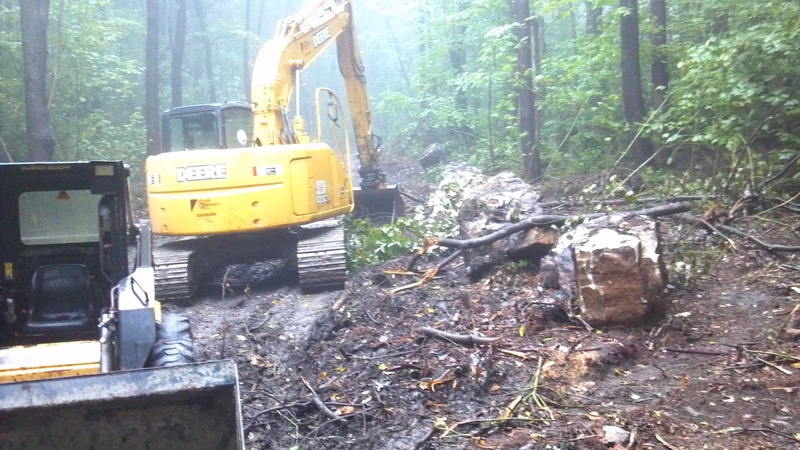 The trail improvement project at Laurel Ridge is now complete. Two new trails were constructed, and two existing trails were improved. All of these trails are within a quarter mile from the warming hut. They are ready for the snow! A new intermediate trail now provides a bypass for the steep hill of the orange trail. The hill on the existing switchback trail was opened up and graded, allowing improved grooming, and smoother downhill turns. The steep, fifty foot section at the top of the of the hill was smoothed out. A new expert loop starts from the red trail. A PA Dept of Conservation and Natural Resources (DCNR) Grant was awarded in 2009. The Grant Sponsor’s are PACCSA, Fay-Penn Economic Development Council, and Mike Mumau, Laurel Ridge State Park Superintendent. Grant funds, matched by volunteer labor was used to enlarge the parking lot, puchase an off road vehicle for trail maintenance, and add these trail improvements. Not related to the grant, the new Purple trail at Laurel Ridge which opened last year was made possible by the combined efforts of Naomi Jarvis, Bob Mazur and Mike Mumau. PACCSA members will get more details on this and other projects in the first newsletter of the season in November. Haven't renewed or joined yet? Make sure you click Join at the top of the page!